Installed and aligned symcap target inside its protective cover. (PhysOrg.com) -- The National Nuclear Security Administration's National Ignition Facility (NIF) has set world records for neutron yield and laser energy delivered from laser-driven capsules to an inertial confinement fusion (ICF) target. NIF researchers will report on these and other recent experimental results this week at the annual meeting of the American Physical Society Division of Plasma Physics in Chicago. NIF, a project of the U.S. Department of Energy's National Nuclear Security Administration (NNSA) was built as a part of NNSA's program to ensure the safety, security and effectiveness of the nation's nuclear weapons stockpile without underground testing. With NIF, scientists will be able to evaluate key scientific assumptions in current computer models, obtain previously unavailable data on how materials behave at temperatures and pressures like those in the center of a star, and help validate NNSA's supercomputer simulations by comparing code predictions against observations from laboratory experiments. Because of its groundbreaking advances in technology, NIF also has the potential to produce breakthroughs in fields beyond stockpile stewardship. NIF experiments have been conducted in support of Department of Defense X-ray testing activities, and NIF experiments in nuclear forensics and other national security areas are planned for the next several years. NIF also will provide unprecedented capabilities in fundamental science, allowing scientists to understand, for example, the makeup of stars in the universe and planets both within and outside our solar system. NIF will also help advance fusion energy technology, which could be an element of making the United States energy independent. "300 trillion neutrons": At 18Mev per fusion reaction, that works out to about .8 kiloJoule total. And it only took "121 kilojoules of ultraviolet laser light" to generate it. So it seems after ten years and billions of dollars they are creeping up to 1% efficiency. But how much energy went into the laser:50 maybe 100 times the 120 kJ figure. Also, how much do these gold-plated hohlraums cost? I assume they are consumed with each shot. Realist, do you suggest we stop all research that hasn't turned a profit in under ten years? General answer: no, for NIF yes. NIF tries to induce fusion in a 2mg DT pellet,like a tiny H-bomb but the fusion yield of an H-bomb is limited to about a hundred times the fission primary(that was true of the first bomb; remains true after 50+years R&D and there is a simple reason for that). 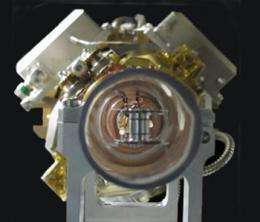 NIF uses flash-lamp induced UV laser. What would be the efficiency of that? : 2% maybe?.--Article doesn't say. That brings up another issue with NIF: the PR they put out is often disingenuous; it borders on dishonesty. They tell you the laser output energy but not the input energy. They talk of "300 trillion neutrons", not the puny energy output. They use the word Megajoule a lot-(A Mega Joule is about a nickel's worth of electricity) but they won't tell you what the hohlarum costs. They laser, however is impressive. What parts of "not intended to break unity" and "built for helping prove nuclear weapons simulation accuracy" do you luddites not understand? What's the point of that? Don't we already know how to build nuclar weapons in any size, configuration that any semi-sane person would want? Let's say they break unity 10 times over with a starting energy of 1 megajoules per shot, so they get 10 MJ energy in every shot, of which about 2/3:rds is lost when converted to electricity. One of those golden hohlraums would be worth 1 kWh of electricity in the grid. This is really just designing a really really big cannon to shoot a fly. To run a plant that outputs 1 GW, you'd have to destroy a million golden pellets every hour. There has to be a more wholesale solution to producing energy, and I'm not at all convinced that the system would work simply by building even bigger lasers and bigger gold pellets, because you're talking about blowing up small fusion bombs in a sequence. Even 10 MJ is the same as blowing up 2 kg of TNT. If you don't release that energy slowly over time, the whole thing will just tear itself apart. If you don't release that energy gradually over time, over a great mass of matter to dampen it, the whole thing will just tear itself apart. It's been said before, Bussard's Polywell, for the win.